There are many ways to enhance the design appeal of your home and some are more effective than others. One of the best ways to give your home a designer edge is with a custom designed fence, which can offer a wide variety of practical and aesthetic advantages. Fences are the first line of security for your home and for this reason it is important that they are strong and have the capacity to withstanding impact and pressure. This needn’t come at the expense of looks, however. A well-designed fence can be a great feature of any home and this is important, because a fence is the boundary to your property and it is the first thing that people can see. Additionally, fences are exposed to the harsh climate of Brisbane all year round and they must be durable to maintain their structural integrity, as well as their aesthetically appealing finish. Here at Dean Wilson Iron, we take all of these factors into account and have developed the perfect fencing solution: handcrafted wrought iron fences. 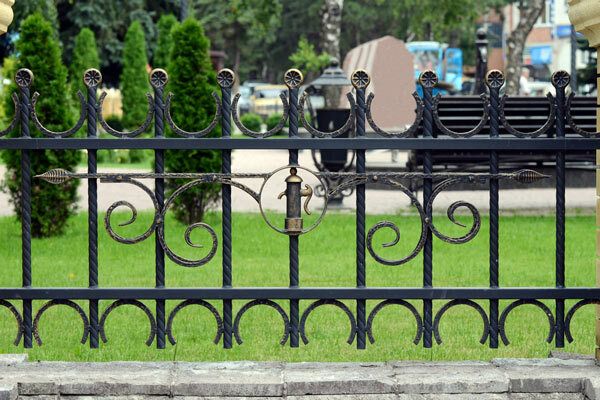 Wrought iron offers many advantages that simply cannot be replicated by other materials and these include its strength, durability and malleability. 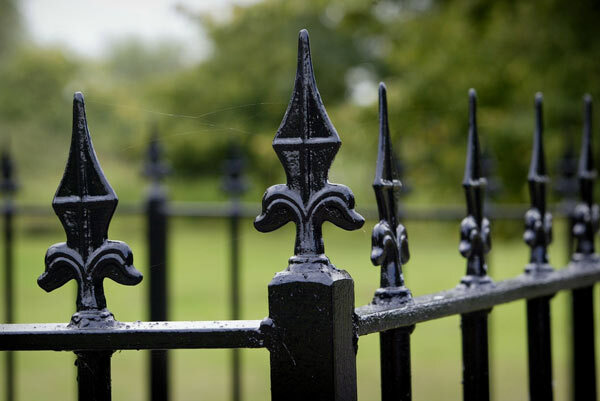 Wrought iron is an incredibly strong substance and it is sure to offer you unrivalled security. It is also extremely durable and, when finished by our expert blacksmiths, will withstand many years of exposure to the changeable and harsh climate of the Brisbane region. 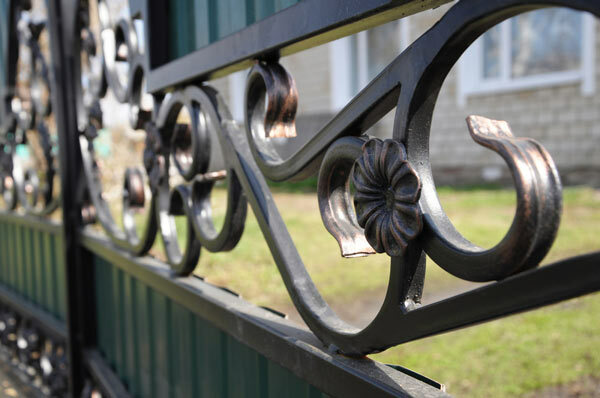 The malleability of wrought iron is what enables us to create intricate and detailed designs that will undoubtedly be the focal point of your property. Wrought iron creations are timeless and here at Dean Wilson Iron, we strive to work with you to develop the most personalised and targeted designs that reflect your own style, whilst remaining practical and functional. Dean Wilson are the team behind some of the most recognisable iron fencing designs in Brisbane and can manufacture robust iron fencing solutions to complement the existing architecture of your home or business. Here at Dean Wilson Iron, we understand that you are likely to have a number of specific needs with regard to your fence and we pride ourselves on being able to cater for all of your requirements – no matter how specific. We are fencing specialists and we have had a great deal of experience both manufacturing and installing a variety of customised fencing solutions. Our number one priority is you and our experts will work closely alongside you to ensure that the final product meets your specifications perfectly. We strive to deliver the most personalised and unique wrought iron fencing in Brisbane and doing this requires close consultation with every one of our clients to expand their design concepts and incorporate them into the manufacture of the product. We offer fences that can fit a variety of applications and these commonly include stand-alone fences with their own personalised fence posts, as well as fences that can fit into block walls. We have found that fences fitted to block work are well suited to homes with pre-existing block and stone structures, or even just homes that are looking to incorporate block work into their fencing solutions for reasons of privacy. In fact, wrought iron fencing installations are a great way to give old stonework a designer edge, as a combination of wrought iron and stone offers a timeless look of elegance and grandeur. Unrivalled and unique looks for the upmost in street appeal. The incredible durability of wrought iron that ensures your fence will remain immaculate for decades to come. The great value for money that comes with a locally crafted, customised fencing solution. The unmatched security of a strong and expertly installed wrought iron fence. 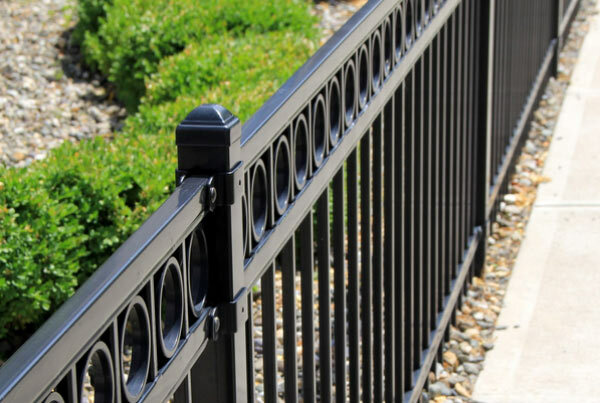 At Dean Wilson Iron, our aim is to ensure that you have consistent input in the creation of your wrought iron fence – from the design phase, to the construction of the final product. We have found this to be the only way to develop the most unique, practical and high-quality creations and it forms an important aspect of our service process. Our process has been tailored, throughout our many years of operation, to account for every one of our client’s needs and it is aimed at working with you to create the perfect fencing solution. We like to begin our process with a detailed discussion of your needs; this allows us to ascertain precisely what you need from your fence and how you envisage the final product. During this discussion, we will cover some specifics, such as where your fence will be installed, how big you would like it to be and the type of design you are aiming for. We aim to bring your design concepts to life in a manner that is practical and functional, so we will explore your design ideas with you during this initial stage and develop a plan to implement your ideal design in the final product. After our discussion of your needs, we should have a clear idea of what needs to be done to create your ideal fencing solution. Based on this, and some basic measurements, we will be able to develop an initial quote for you that will cover the work necessary to create your wrought iron fence. We can provide you with this quote instantly, which ensures that you will have plenty of time to consider your options. We encourage you to outline any concerns you may have, or present us with any questions – our team will happily clarify any points of confusion. After our initial consultation and quote, we will have the details necessary to commence work on your fence. Your satisfaction is very important to us and for this reason, we insist on keeping you well informed throughout the construction of your personalised fence. Our team can update you by way of progress photos, at various stages of completion – we even invite you to come and inspect the progress yourself, if it is convenient for you. Our blacksmiths have a wealth of knowledge and expertise, so you can rest assured that the build of your perfectly design fence is in the industry’s safest hands. Once your customised fence has been completed to your satisfaction and in line with our uncompromising standard of quality, it will be ready for installation. Our experts are skilled at not only creating your wrought iron fencing solutions, but also at installing them. We offer a comprehensive range of installation services and we are able to fit your fence perfectly to the area it was designed. This ensures that the quality of installation will be unrivalled, to complement the strength and design of the fence itself. We can install fences to block walls and brickwork, or we can install a freestanding fence with its own wrought iron posts – it depends entirely upon your needs. If you are seeking a unique fencing solution then contact us today. Our wrought iron fences incorporate quality, security and design to create the most personalised fencing solutions in Brisbane. If you have any queries or would like to see some photos of our custom fences across the Brisbane region, then you can find us on Facebook. #1 How long will a wrought iron fence last? Wrought iron is one of the most durable materials on the market and, if well maintained, it can last you a lifetime. Maintaining your fence is simple and usually a gentle wash with soapy water, followed by a rinse, will be sufficient. This will only be necessary every once in a while, however the frequency of each wash might need to be a little higher if your fence is installed in an area that might subject it to damage – such as the roadside or a particularly dusty spot. #2 Will my wrought iron fence resist rust? All of the wrought iron we use at Dean Wilson Iron is treated extensively and finished to perfection, so as to ensure that rust will not be an issue. We start the treatment by sand blasting the metal, before applying a protective zinc coat, which acts as a barrier. Finally, we apply a decorative powder coat, or a hand-rubbed natural iron finish to safeguard effectively against the Brisbane weather. #3 How long will it take you to complete my fence? The time taken for our blacksmiths to complete a fence depends mostly on its size and design. Larger fences will take longer to completed and because all of our products are expertly hand crafted, it is best to allow as much time as possible, to ensure the ultimate finish. On average, our wrought iron products take between 6 and 8 weeks, but it is best to consult one of our specialists for a more specific timeframe. #4 Do you guarantee your custom fences? Here at Dean Wilson Iron, we have an unfaltering dedication to quality; a team of expert blacksmiths have carefully handcrafted each of our products so you can rest assured that its quality will be unrivalled. To support this, we offer a ten-year guarantee on our products against rust, installation and manufacture.